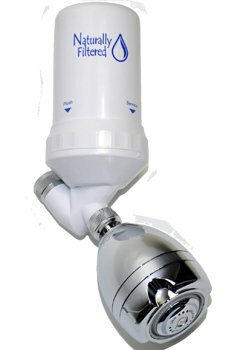 Those of you who know quality are familiar with the Wellness Shower Filter. Unfortunately the company went out of business and many were left searching for the rare Wellness Filter. Now you can get the same great filtration. This filter is built by the same facility that built the Wellness Shower Filter. In fact, the filtration, backwash feature, showerhead, and design are the same. The main difference is that this shower filter does not contain the Wellness enhancement media which added stabilized antioxidants and imparted other beneficial characteristics to the water. This filter has the very high grade filtration that preceded the enhancement media in the Wellness Filter, so you know you’re getting the best system available. In fact, this is one of very few shower filters tested to NSF standards, and it outperforms all others on the market. Also, due to the unique backwashing feature each cartridge is rated to remove over 90% of chlorine for a full year. You get all of this for a price comparable to far less effective systems that require frequent cartridge changes. Our filter will dramatically reduce the harsh chemicals in city water, and eliminate problems such as itchy skin and lethargy caused by the chemicals in your water. Try the new Naturally Filtered Shower Filter today!